Could you lose the Internet on July 9th? The answer is possibly. If your PC is one of the estimated 350,000 computers still infected with a trojan horse malware program that redirects your Internet to places the malware creators want you to go to for advertising revenue. 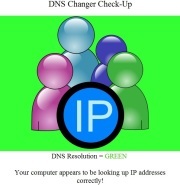 To see if your PC is infected you can go to this DNS Checker website to see if you have a problem. If you do have an infection you need to have your system cleaned so that come July 9th the Internet will not appear to go dark. To keep your system clean make sure that you keep your anti-virus software up to date, install all Windows security patches and updates, install all Adobe Flash and PDF reader updates and Java updates, and download and run a malware remover program like Malwarebytes.